BRM kolo z lehké slitiny v chromu 5 paprskové 1ks 5.0 x 15 - ET +14 - PCD 5 x 205 mm. Pro Brouky a Karmann Ghia r.v. 7/65 výše a busy r.v. 7/70 výše jsou v některých případech středové krytky pro přední kola příliš mělké. Proto je nezbytné objednat vyšší (# 9704). Zadní jsou bez problémů. BRM kola jsou standardně dodávaná bez šroubů nebo matic (ventilek je součástí dodávky). 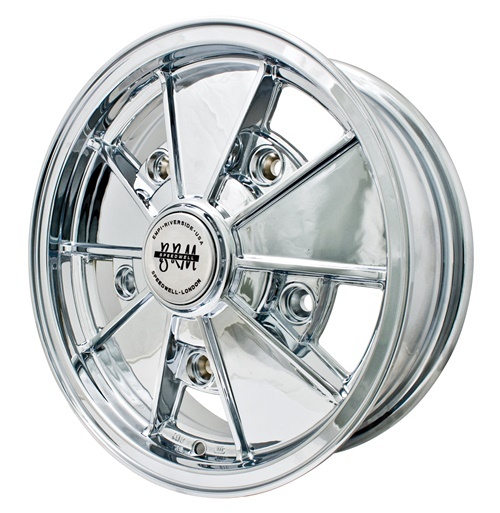 BRM wheell 5 spoke chrome each 5.0 x 15 - ET +14 - PCD 5 x 205 - backspacing: 3-7/16 inch. BRM wheels, good news for old -school fans, the BRM rim is back. Introduced middle been in collaboration with EMPI and long time Speedwell 60s out of stock on the old -school and resto -look craze is back with a vengeance, though we speak we do have a reproduction of the original from the 60s . The BRM is almost as popular as the EMPI 5 or 8 spokes, hence the range BRM's growing, it all started with 5 x 205 mm stitch in 15 inch and now they are 17 inch available and applicable to all our VW models. For Beetles and Karmann Ghia's t / m 7/1965 and the buses t / m 7/1970 is supplied velgdop too shallow, the front brake drums stabbing in these model years too much, to the rear is not a problem. It is therefore necessary to on this building years velgdop (# 9704 to order that is higher.) To give you a tip, please replace the rear wheel caps for higher, it is a strange sight as you drive around with two different wheel caps. All BRM's are supplied without bolts or nuts (valve included).